Rebekah dreams of Freya and sees Freya being taken away by her aunt. Freya now stands beside Rebekah's bed looking down on her. The wolves are gathered in the woods and Klaus announces that he is looking for Hayley and reminds them all that there are children present. Deep in Bayou, Hayley is again saying that she cannot tell her secrets and once again, Jackson is incredulous that there is a secret which is so bad that Hayley cannot tell him. Hayley points out that its not safe but Jackson counters that it has never been safe and that their people have been hunted and exiled. Jackson argues that the wedding will change all of that by creating a new pack. Jackson does however add that if Hayley doesn't tell her secrets, they are back to square one. Jackson then reveals that even if they call off the wedding, there is something he has to tell her. Jackson, it seems, knows how Hayley's parents died. Rebekah is up and moving around the house and she takes a seat next to Cassie. Rebekah hands Cassie an apple, saying that she doesn't care about rules. Cassie tells Rebekah that she is out of her mind but Rebekah declares that she is not spending another night in this dungeon. Rebekah it seems has figured out that any spell can work if enough power is channeled. Rebekah reveals that she went to the room with the lock door and that there is a woman in there (yep, that's her big sister Freya) and that she is strong. Rebekah suggests that they can channel Freya and break out. Cassie takes the apple and as they walk around, they discover a new watch (yep, that's Freya). Rebekah is wonders if she knows the witch and gifts her with an apple before taking off. Davina wakes to find Kol prepared to work on a dagger for Klaus. Davina pauses and Kol questions if Davina is having second thoughts, reminding her that she wanted to get rid of Klaus without hurting her friends. Davina checks her phone and realises that Josh and Marcel are still missing. The vampires are now being channeled by Finn, who tells an unconscious Marcel that he led the vampires to this. Finn wonders about the secrets Klaus has shared with Marcel and questions what he has to do to tear the secrets free. Klaus has arrived at Mary's home in Bayou and asks to be invited in. Mary calls Klaus a vampire and says that it's not likely. Klaus points out that he is a hybrid and could potentially be a distant relative of Mary's. Klaus then asks about Hayley, adding that he wants to remind her of the importance of family. Mary reveals that Jackson is with Hayley now and adds that the two of them can look out for themselves. Klaus snarks about what Jackson will gain from marrying Hayley and then leaves to hunt them down himself because of Mary's refusal to help. Jackson and Hayley walk through an area where wolves bury those who walk away form the pack. They stop at Jackson's grandfather's grave, where Jackson reveals that it was his grandfather who killed Hayley's parents, in order to stop an alliance with Marcel. It seems that Jackson didn't know until Mary told him and he decided that he had to be the one to tell Hayley, though he didn't know if he could. It turns out that this was Jackson's secret and he tells Hayley that she doesn't have to tell him hers, adding that it won't change how he feels about her. Klaus interrupts and asks for a moment with Hayley. Hayley tells Jackson that it's fine and promises to meet him back at Mary's. Back in witch prison, the young woman (read: Freya) has been discovered with the contraband apple. When Freya is confronted by the matron, though Cassie begs her not to, Rebekah intervenes, only to have her hand broken by a tire iron. When Freya asks why Rebekah helped, Rebekah responds that maybe, she just likes the idea of the girls sticking together. In the bayou, Klaus demands that Hayley refrain from divulging any family secrets, especially those which involving Hope. Hayley however is worried about the continuing threat of Finn and his growing powers, adding that it is not a risk if Jackson can be trusted. Hayley says that they could in fact have a werewolf family to protect Hope but Klaus is not convinced and argues that he can protect Hope. Hayley believes that they need to consider this because this means that Hope could be brought home. Klaus makes it clear that he has made his decision and in this case, there is no one above his decree, not even Hayley. Klaus demands that Hayley call off the wedding but Hayley makes it clear that she doesn't take orders from anyone. Aidan shows up at Kol's and Kol snarks about losing his secret lair. Aidan hands over Josh's toothbrush and brush and Davina and Kol joins hands to do a locater spell. The spell leads to the store Lenore used to own before she was taken over by Esther. Aidan grabs his things to leave and Davin stops him saying that he cannot go alone, calling it a suicide mission. Kol interjects, adding that having Davina join, would simply make it a dual suicide mission. Aidan is determined not to leave Josh with a "nutjob" who hates vampires. I have to say that it is nice to see the concern that Aidan has for Josh. Dare I hope, that The Originals will actually grow the romance between these two, or are we being set up for the oft occurring gay death? In witch prison, the matron makes her way upstairs and stares at the locked door. The door opens on its own mysteriously and she gets sucked in. I suppose that will teach her to mess with Rebekah. In the bayou, Hayley makes it clear that she is not going to tolerate Klaus giving orders about protecting Hope and points out that it was Esther who tried to kill Hope in the first place. Hayley adds that they don't know what Finn is up to. When Klaus says that he will deal with Finn, Hayley questions what comes next, adding that Hope will always be the daughter of a Hybrid killer with a thousand enemies. Hayley says that it is Klaus who is the threat and again points out that the wedding means Hope can come home because the wolves will be on their side. Klaus argues that the wolves cannot be trusted and says that he killed his own father to protect Hope. Hayley questions if Klaus was just so terrified to let anyone in because he is paranoid. Hayley again argues for the wedding, asking Klaus to trust her and though Klaus makes it clear he trusts Haley, he snaps Hayley's neck, saying that he doesn't trust Jackson. Marcel awakes to find himself tied with vervain soaked ropes and less hungry because Finn at least reduced that part of the spell. Finn says that Klaus has a secret he is desperate to protect and asks Marcel what it is. Marcel calls Finn a chump and Finn uses magic to hurt him, again demanding Marcel cough up what he knows. Marcel brings up a coffin he found two centuries before and Klaus telling him that he kept Finn in there because Finn is such a bore. Rebekah awakes to find Freya standing over her bed, asking if New Orleans is as beautiful as she remembers. 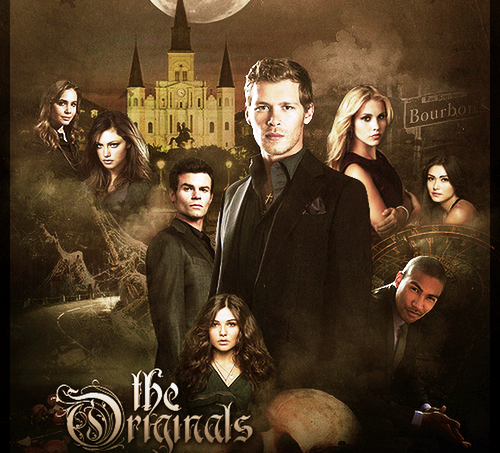 Rebekah replies that New Orleans will be beautiful long after the two of them are dead. Freya then asks why Rebekah is here, so Rebekah explains Kol's trickery and betrayal. Freya is confused that Rebekah fights with her family and suggests that Rebekah should stand beside them. Rebekah is explains that it's 1000 years complicated. Rebekah reveals that she may have found a way out and asks Freya to meet her at the front door in twenty minutes. Jackson is doing the dishes and Mary holds up stake saying that it is for Klaus. Klaus shows up at the door asking to see Jackson and explains that Hayley is resting. Jackson demands Klaus promise that this is between the two of them, so Jackson steps outside, only to be grabbed by Klaus. Jackson finds himself thrown on the ground, so he calls out to Klaus, asking if Klaus wants to fight. Klaus declares that Jackson has mistaken his intent, adding that he is here to execute Jackson. Klaus asks Jackson how he wants to die. Klaus quickly starts beating Jackson and questions if Ansel taught Jackson to loathe him. Jackson snarks that Klaus is jealous that he got to spend time with his daddy. Klaus continues to beat Jackson in response, accusing him of using Hayley's intentions for his own power grab. Jackson struggles to his feet, saying that Klaus is wrong, only to be knocked down again. Klaus attacks, saying that perhaps Ansel saw in Jackson the son he always wanted. After beating Marcel, Finn is now convinced that Marcel knows nothing. Kol enters the shop and says that he owes Marcel. Kol sticks a knife in Marcel's hand and then uses his magic to snap Marcel's neck. Finn is not pleased to see Kol, pointing out that Kol sided with their wretched siblings. Kol answers that he takes sides with whomever he thinks is going to win and since hearing about what happened to Michael, he knows which way the wind is blowing. Kol tells Finn that he will be happy to see Elijah, Klaus and Rebekah get exactly what is coming to them. Finn uses his magic to drive Kol to his knees and Kol stands, pointing out that he is the one who put Rebekah in another body and while Klaus is out looking for Rebekah, he made a dagger to put Klaus to sleep for centuries. Finn makes it clear that he doesn't want to see Klaus asleep but dead. Kol argues that Finn is going to need allies and that he has one in the form of Davina - a harvest girl. Kol swears to having Davina wrapped around his finger, adding that with Davina on their side, nothing will stand in their way. In the Witch house, Rebekah makes her way to Cassie's bed to find her gone. Rebekah then heads to the locked door, to find it once again open. Rebekah walks inside and finds the matron dead on the floor. When Rebekah looks in the coffin, she finds it empty. Cassie appears and tells Rebekah that she is sorry, adding that she told Rebekah that there was no escape. The matrons enter the room and Cassie tells Rebekah that her only regret is that she didn't stop her before she killed one of her own. Rebekah puts up a good fight but is overwhelmed. Freya enters the room and tosses aside the matrons and turns her attention to Cassie, unimpressed that Cassie betrayed a friend. Freya grabs Cassie's head and uses her magic to kill her, telling Rebekah that she despises traitors. Freya helps Rebekah get to her feet and heals her wounded hand. Jackson starts to crawl away from Klaus, declaring that he loves Hayley and will fight for her until he is dead. Klaus grabs Jackson and Jackson asks Klaus to help Hayley set their people free, if Klaus kills him now. Before Klaus can act, Hayley intervenes, fighting Klaus briefly and making it clear that Klaus is not going to kill Jackson because she trusts him. Hayley adds to kill Jackson, Klaus will have to go through her. Klaus finally relents, saying that Jackson and Hayley may be meant for each other. Klaus tells Hayley to tell Jackson but promises to deposit Jackson's head on the end of a spike, if he ever betrays Hayley, before disappearing. Finn is curious about the fact that both Klaus and Elijah know that Kol trapped Rebekah and have not tracked him down yet. Finn says that he cannot find Elijah adding that Elijah must be keeping something hidden. Kol snarks that Finn is acting like a crazy Sherlock Homes, to which Finn reveals that he knows about Kol's friends in the back. True to form, Davina and Aidan are standing over Josh. Finn knocks Kol on the ground, saying that he is going to send a message to Davina. In the backroom, the vampires all wake up hungry and Aidan is forced to snap Josh's neck. Freya opens the doors to the witch prison and explains to Rebekah that she has just woken up from a century of sleep and she wanted to see what Rebekah was really like. Freya tells Rebekah that she is willful but kind and is not half as bad as their brothers. Freya reveals that they met at a Christmas party in 1914 when Freya was desperate to catch a glimpse of her family. Rebekah realises that she is talking to her sister Freya. Freya opens the gate and gives Rebekah instructions tell their brothers that when she arrives shortly, she expects their best behaviour. Kol awakes and tries to make a run for it, only to end up in a den of hungry vampires. Finn follows and puts the vampires back to sleep, saying that Davina has taken one of his prisoners. Kol says that he didn't come for a fight and tries to blame everything all on Davina. Finn is not impressed with what Kol has done with his rebirth but Kol tells Finn that when he is angry, Finn doesn't think straight. Kol asks for a chance but Finn says that he is going to give him death because that is the one thing Kol fears most. Finn traps Kol in his present body, unable to change to another, promising him a meaningless lonely death. Mary has finished nursing Jackson and Hayley apologises but Mary says everyone has baggage in their past. Mary leaves, impressed that Hayley fought for Jackson. Hayley and Jackson talk about why Klaus didn't kill him and she offers Jackson her hand, saying that she wants to tell him a story about a beautiful baby girl. Klaus is on the phone and he tells Elijah about the upcoming marriage between Hayley and Jackson. Klaus makes it clear that once the wedding takes place however, Jackson's fate will become a little less certain. When Klaus hangs up, Rebekah strolls in saying that he will not believe the week she has had. Marcel is still tied to the chair and awakes to Finn. Marcel bargains agreeing to answer one question, if his vampires are allowed to go free. Finn says that Marcel was once in possession of Hope's corpse and asks how the baby died. Marcel doesn't answer and Finn questions why Marcel was compelled to forget and further why Klaus would compel away the truth from Marcel of all people. Finn declares that Klaus's daughter is still alive and says that Marcel and his vampires are going to help him find her. There was a ton of drama this episode. As much as I love Joesph Morgan, I am sick to death of his teary eyed performance regarding Klaus's daddy issues. To be fair to Morgan, this is the fault of the writers and not his. Morgan is an amazing actor and they need to give him more variety. Am I the only one who is tried of hearing about The Original siblings and their mommy and daddy issues. Freya's storyline looks like it could have some potential. Is she going to bring the family together finally? Earlier in the season were were made aware of the terrible deal Esther made with her sister to have children and so that threat is still outstanding. While Freya be the glue that brings them together to fight the upcoming threat? If nothing else, Freya looks like she will be a strong female character and at the very least, magically at least a match for Finn. I don't want to see her be weakened the way that Rebekah constantly is when juxtaposed to either Elijah or Klaus. I really liked that Aidan didn't stop looking for Josh when Klaus went off to search for Hayley. Slowly, Aidan's relationship with Josh has been growing and it's kind of sweet to watch. I so want them to develop into more than secondary characters to affirm their roles on the show. It is worth noting that at least thus far, they are better characters than the the two portrayals we have seen on The Vampire Diaries. I must admit however that when they are on the screen, I worry that one of them will be summarily killed off, so yes, I am watching with my fingers crossed. Onto Jackson, is it me, or is his character irritating. Every time he declares his love for Hayley, my stomach turns sideways. He has known Hayley for a N.Y. minute. His expressions of love read false to me and deeply uncomfortable.